We love this idea from Sugar Bowl Bakery: strawberry skewers with marshmallows and brownie bites. They’re quick and easy to put together. Let the kids do it as their contribution to Valentine’s Day. 1. REMOVE the stems and leaves from the strawberries; wash and pat dry. Slice off the tapered bottoms so there will be a flat edge against the brownie bites and marshmallows. 2. CUT the brownies in a size that matches the marshmallows. Squares are O.K., but circles cut with a small cookie cutter are better. 3. 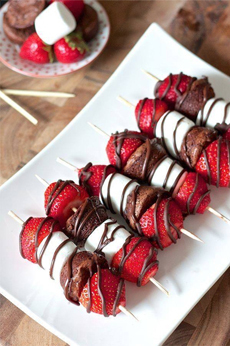 ASSEMBLE: Place strawberries on each end of the skewer, with a marshmallow and brownie bite in-between. Fun snack skewers for Valentine’ Day. Photo courtesy Sugar Bowl Bakery. 4. GARNISH as desired with Magic Shell chocolate sauce. You need a sauce that hardens, or things will get messy. *Magic Shell is made in six flavors: Caramel, Chocolate, Chocolate Fudge, Chocolate Mint Cookie, Chocolate Pretzel and Funfetti Vanilla Cake.